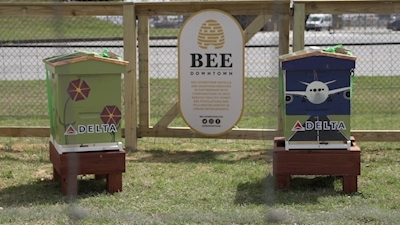 Today, Delta became the first Atlanta company — and first U.S. airline — to host honey bee hives built and supported by Bee Downtown, an innovative North Carolina startup focused on stabilizing the healthy honey bee population by allowing businesses to host hives. Delta's three hives are located at the airline's world headquarters in Atlanta and will be monitored by trained beekeepers from Bee Downtown. The hive boxes depict a Delta jet just before touchdown in a field of cheerful spring-flowers with red, triangular petals resembling Delta's treasured logo-icon. They were painted by Melissa Robbins and Dr. John Shorter, local artists from the startup's hometown of Durham. 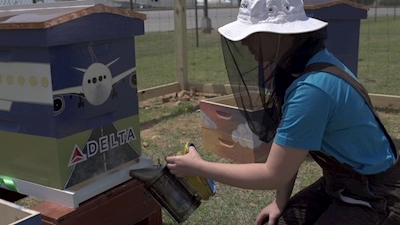 The bee hive initiative supports Delta's goal to be an environmentally sustainable, responsible business. Delta's honey bees can fly up to three miles in search of nectar, contributing to the plant life in Delta's hometown community. "Part of being a sustainable company is taking care of and supporting the communities where Delta people live, work and serve," said Christine Boucher, Managing Director — Global Environment, Sustainability and Compliance. "While Delta does this in a number of ways globally, we're excited to be partnering with Bee Downtown to positively impact the areas directly surrounding our world headquarters to support and build a healthy honey bee population." Bee Downtown founder and CEO Leigh-Kathryn Bonner decided to start a business — or "beesness" as she calls it — in response to a 40 percent decline of the honey bee population over the last decade. Bonner, 25, was recently recognized as one of Inc. magazine's 2018 30 Under 30 for her efforts. "Every third bite of food we eat is thanks to a honey bee. They're the backbone of our agricultural system. Bee Downtown fights the devastation of these important natural workers by installing and maintaining company-sponsored hives in urban areas, where bees thrive due to diverse food sources and stable living conditions." Bee Downtown is one of eight companies that received investments from the Atlanta-based Engage accelerator that offers mentoring, education and collaboration opportunities for startups that work with the 10 founding companies — of which Delta is one. 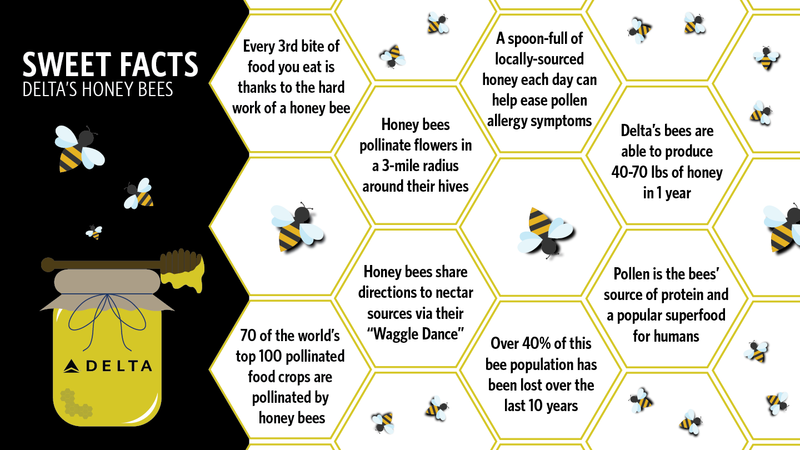 The honey bee is a vital part of the ecosystem, pollinating 70 of the world's top 100 food crops, which feed billions of people across the globe. They also support the growth of trees, flowers, and other plants, which serve as food and shelter for wild animals and insects. 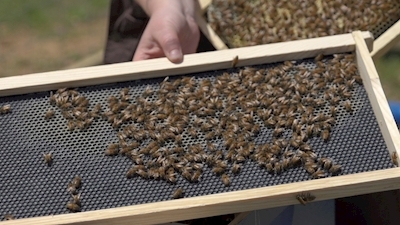 Each of Delta's hives can produce 40-70 pounds of honey per year. Delta will determine how to best use that honey to benefit the community once its yields are known. The Bee Downtown project engages the airline's employees with beekeeping training, leadership development and teamwork sessions provided by Bee Downtown. Jesse Miers, Senior Engineer in Delta's Operations and Customer Center and President of Green Up — one of Delta's employee-run business resource groups — shared why this type of initiative is important to employees. "I was glad to see that Bee Downtown offers engaging employee activities for its clients," said Miers. "Delta people from any department will be able to get involved in this great initiative while learning more about the environment and why it's so important that we do all we can to both enhance and preserve it for future generations." For more information about Delta’s sustainability efforts visit the Environment page on news.delta.com. Honey bee hives have highly developed systems and processes to keep their busy hives productive and sustainable for years to come. They are even able to communicate the location of a source of nectar over three miles away via their "waggle" dance. The dance is a series of shakes, shimmies and turns in relation to the sun, creating a bee line for other foragers to follow. During winter, honey bees crowd into their hives to form a "winter cluster" huddling around the queen to keep her warm. To ensure no one bee gets too cold, they rotate throughout the cluster from outside to inside. The colder it is outside the tighter the cluster becomes. Female honey bees are the defenders of the hives as they are the only ones equipped with stingers. Pollen is the single source of protein for the bees as well as a popular super food for humans often used in smoothies. Bees don't like the cold, staying in their hives until outside temperatures reach 50°F or above. Honey bees are very docile and want to avoid stinging because they will die shortly after.